Bust your birds' boredom while boosting natural behaviors and nutritional health in your flock by thinking like a zookeeper. Imagine that you lived your entire life in a confined area—say, a 500-square-foot room. Imagine that, within this room, somebody served you the same food every day at the same time. Imagine your furniture was bolted to the floor and your few possessions never changed. Imagine you always saw the same view, smelled the same scents, heard the same sounds. You’d probably get bored, wouldn’t you? You might even go a little crazy. The old saying “Variety is the spice of life” doesn’t apply only to us humans. Though they can’t express it in words, animals living in confinement often show their boredom, anxiety or depression in ways we recognize. A lion paces a concrete zoo enclosure. A dog howls and chews up its kennel. A cooped chicken constantly picks on its flock mates. But what if these animals had changing opportunities each day to exercise their minds, senses and bodies? What if, for example, you let the lion stalk a big plastic ball, gave the dog a puzzle toy to extract kibble from and sent the chicken searching for tasty mealworms scattered in the straw? While their boredom might not vanish, research shows that—in many cases—problem behaviors such as the ones mentioned would decline. This is the premise of environmental enrichment, a boredom-busting practice now embraced by many zoos. As you’ll learn, it’s a practice we can easily extend to our clucky, cooped-up companions—a practice that will benefit them as well as us, their caretakers. In fact, chances are you’ve been using some enrichment techniques on your flock already. Among various species studied, positive changes include decreases in pacing, self-aggression such as feather plucking and aggression toward cage mates. It also results in increases in activity, breeding success and overall wellbeing. “Enrichment efforts focus on giving animals control of their environment and opportunities to use the skill sets they’re supposed to be exercising in the wild,” says Andrews, who works for Natural Encounters, an animal behavior facility in Winterhaven, Florida. Even though chickens have long been domesticated, they’ve inherited from their wild red junglefowl ancestors a varied repertoire of behaviors, such as foraging, dust bathing and roosting. In short, environmental enrichment gives our chickens more opportunities to act like chickens. Novelty and variety are important components of an enrichment program. For instance, tossing mealworms to your flock every day at the same time in the same way eventually loses its “wow” factor. Instead, you would vary the routine by serving mealworms at different times and in different ways—say, in a paper bag or treat dispenser. On other days, you would substitute alternative treats. “Chickens get tired of things real quick,” says Grant Shippell, a chicken keeper in Marshall, Michigan, who makes it a priority to vary the food treats he gives his six Barred Rocks. Shippell recounts how his birds swiftly grew bored with the cat food he provided during molting time, necessitating a temporary—and for the chickens, exciting—switch to black oil sunflower seeds. Likewise, they at first seemed thrilled about the homemade swings he installed in their coop but eventually lost interest. 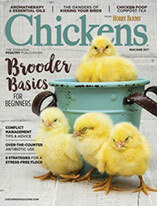 Before launching or expanding an enrichment program for your flock, Andrews advises first getting to know your birds and how they spend their time. If you want to decrease feather pecking, for example, try to estimate how much time your chickens engage in this destructive behavior during a set observation period. Then, once you’ve figured out how you want to give them the opportunity to change it—say, by hanging a cabbage in their coop—and implemented your scheme, watch them again. Has there been a change? Do your hens spend more time savaging the cabbage now instead of each other? If so, hurray! Your enrichment worked. You might consider keeping notes about what you’ve tried and the results, like a zookeeper would. Wild birds spend much of their day foraging for food, and given the chance to range, domestic chickens are no exception. These omnivorous fowl love to search out bugs, seeds, fallen fruits and more. It’s no surprise, then, that different kinds of food enrichment are often a big hit with poultry and their keepers. Rhoda Peacher, who keeps a mixed flock of 18 on her farm in Sherwood, Oregon, supplements her feathered friends’ balanced commercial diet with a changing extras menu throughout the year. Forage-wise, winter can be an especially dull time for chickens, she points out. Peacher’s birds receive foods including dried mealworms, steak bones, skins and seeds left from grape-juice-making, apple pulp (which she freezes for winter use), and leftover pasta and pizza. Paula Cash, another poultry raiser in Sher-wood, Oregon, treats her diverse flock of 10 heritage breed hens to something different nearly every day, too. Changing up your method of delivery also adds interest, and not just for the birds (after all, you’ll get to enjoy their feeding frenzy antics). To increase active feeding, Andrews explains, you can toss mealworms onto artificial turf or scatter them in the grass. Or try rolling cracked corn into a paper ball, hanging veggies on stainless steel skewers made for parrots or hiding food in puzzle feeders. “[With supervision] a lot of the puzzle feeders made for dogs are good for chickens,” he says. Peacher’s birds enthusiastically dig in when she serves them a giant zucchini cut in half lengthwise then sprinkles feed into the troughs they make. Cash’s chickens relish a compressed grain enrichment supplement called a flock block from time to time. Shippell’s birds are keen to pluck veggies from a hollow plastic ball—a repurposed dog treat dispenser toy—that he hangs in their coop on occasion. Unlike wild fowl, many chickens live much of their lives in a restricted and comparatively barren space: the coop. To give your flock a new perspective on their environment, Andrews recommends periodically moving around or changing their coop furniture, such as perches. You can also vary perch size and material. For instance, along with their wooden roosts, Cash’s hens enjoy a jungle gym of three stacked hay bales that she regularly replenishes and moves. Another way to add interest to your flock’s habitat: Offer exciting new natural materials for scratching pleasure. If those substrates contain buggy or weedy delicacies to dine on, that’s even better. Cash treats her lucky birds to leaves in the fall, and during winter, Peacher does the same with wood chips left from tree work. While gardening, she also dumps dandelions and other weeds into their pen. Shippell regularly offers his chickens a big scoop of plain old dirt. “They go crazy over worms, so every time they see I have a shovel, they’re right there,” he says. If possible, safely giving your flock new habitats to explore will also enrich their lives. A beekeeper who shies from pesticides and herbicides, Peacher has also started freeing her flock to roam the large fenced yard and perform eco-friendly weed control on her gravel driveway. 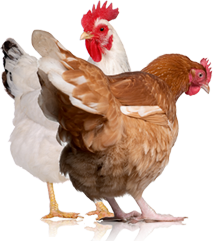 Never give your chickens moldy foods, and remove leftovers promptly to avoid spoilage. Mold toxins can sicken or kill your birds. Avoid the following foods, as they can cause illness or affect egg flavor: chocolate, onions, garlic, dried beans/rice, avocados, salty/fatty foods and green potato peelings. Don’t sabotage your flock’s balanced diet or cause digestive problems by going overboard with extra treats. Strings, ropes and chains can pose an entrapment or strangulation hazard. Bird trainer Nathan Andrews recommends covering these with a section of stiff hose or aquarium tubing when hanging enrichment items. Inspect perches and other coop furnishings regularly for exposed nails, loose wire and other potential hazards. Don’t give your birds easily breakable toys or small items they might swallow, and check toys regularly for wear and tear. Roaming chickens are at a greater risk of predation. Supervision, secure fencing and ensuring your birds stay in protected housing at night will go a long way toward keeping them safe. If in doubt about the safety of an enrichment item or method, skip it or take time to supervise. To tantalize your flock’s senses, try playing music or bird songs for them, rubbing some fragrant spices on their furniture (their sense of smell is similar to ours), or setting up a shiny pinwheel outside their coop. Shippell’s chickens found it fascinating—at least for a while—when he hung a mirror in their run. 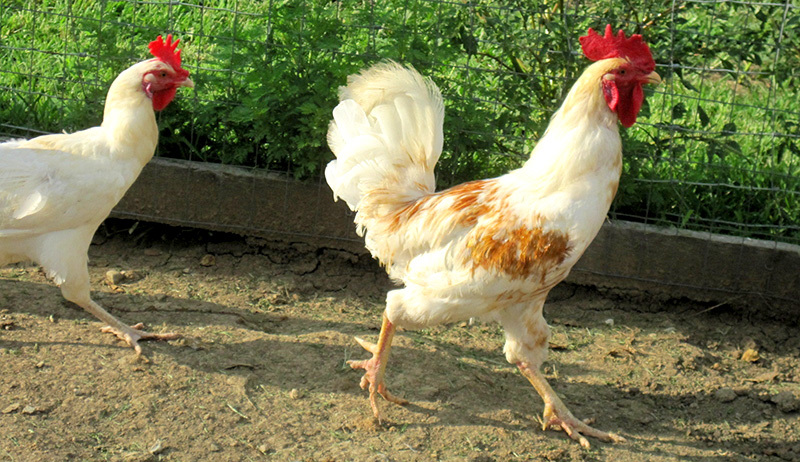 To boost cognitive functioning, try clicker training; chickens are very trainable. As flock-loving creatures, social enrichment—offering them the compatible companionship of their own kind and human attention—is important. 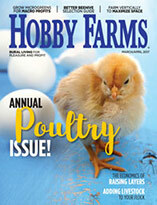 You can find other boredom-busters by asking fellow poultry enthusiasts. Don’t be discouraged, however, if one or more of your chickens seems unappreciative of an enrichment you think is dandy. Andrews also cautions that great enrichment can sometimes increase your workload (think of all that shredded cabbage you’ll have to clean up). “But the improvement in animal welfare is absolutely worth it,” he says.